Two days later, in nearly vertical sunlight, I took still more shots up on the roof. 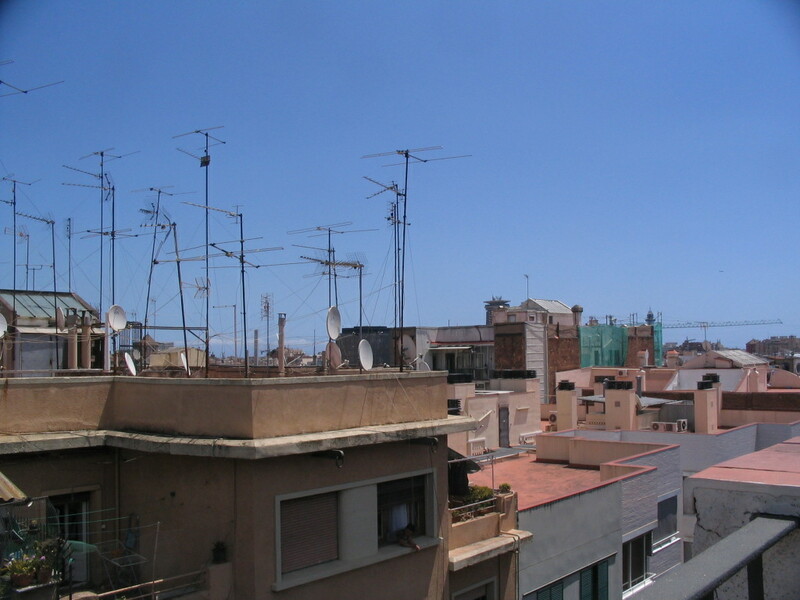 The antenna and terrace landscape across the street. 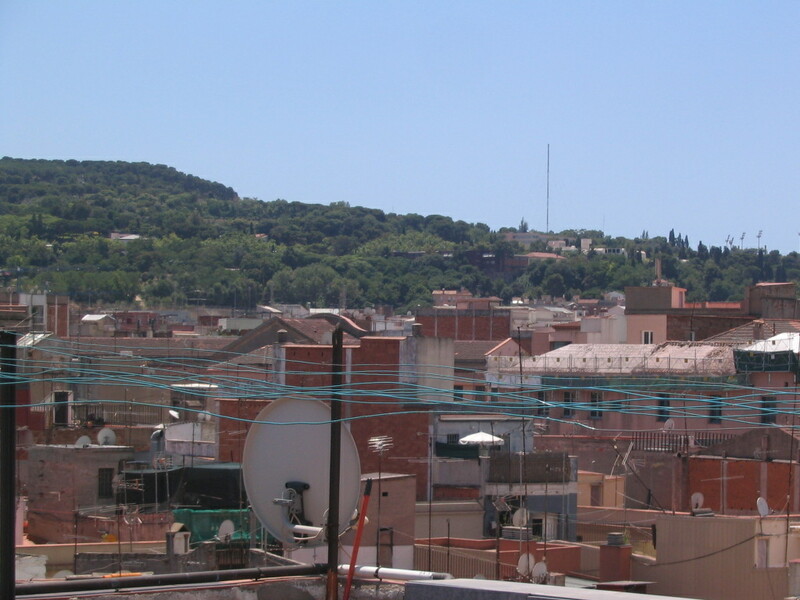 On the right flank of Montjuïc are visible a few museums, such as the Miró Museum. 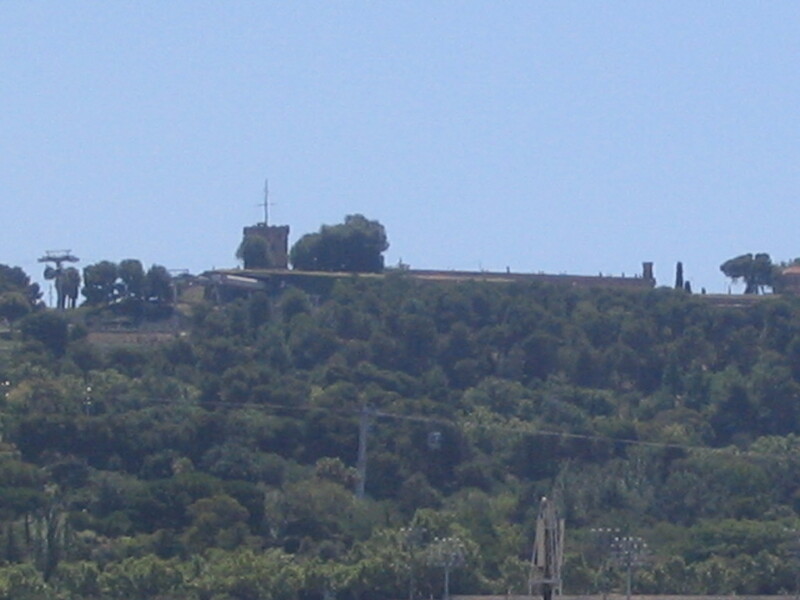 The Palau and the Olympic stadium tower, much more easily visible. 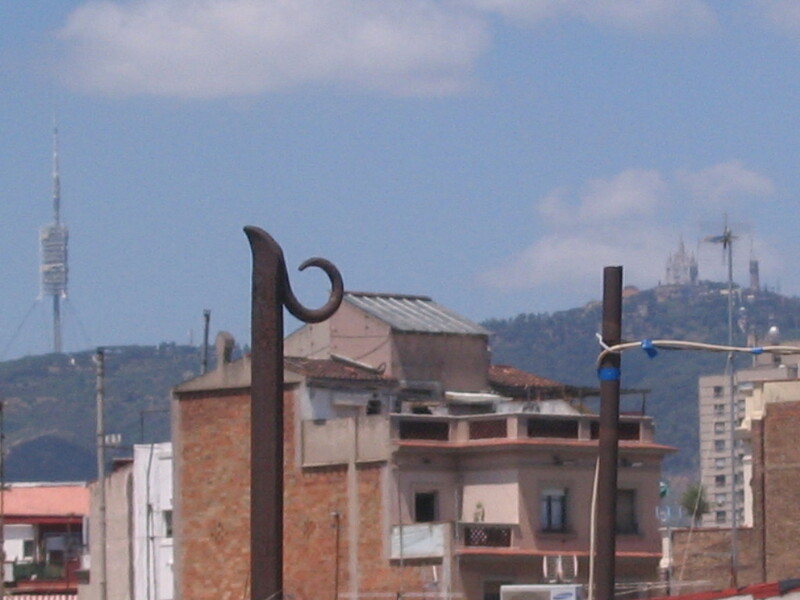 Tibidabo and the Collserola tower. The afternoon/evening before this, I had gone on a 13-mile round-trip run up to both. Notable points on the run included: seeing wild hogs a couple of times on the way up; bushwhacking some of the way; seeing Montserrat from the summit of Tibidabo as well as, of course, a fantastic panorama of Barcelona; and having a wildly curvaceous descent down the Vallvidrera road as dusk approached and passed. 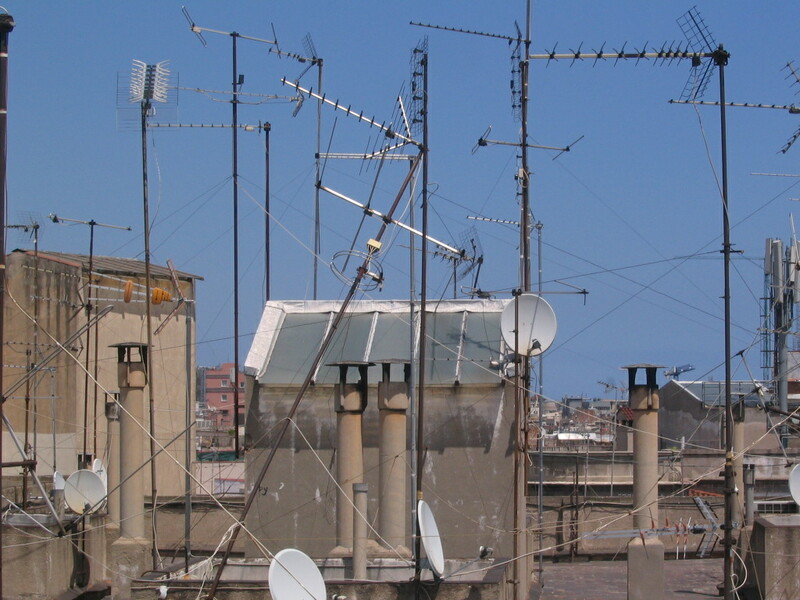 Not just the antennas themselves are innumerable, but also the wires holding them up. 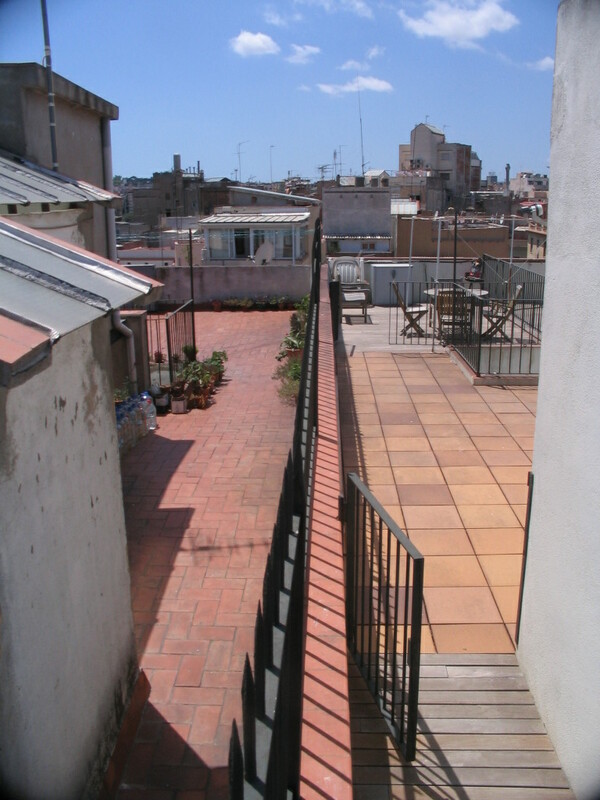 A slightly new view from standing on the demising wall; I avoided impalement. 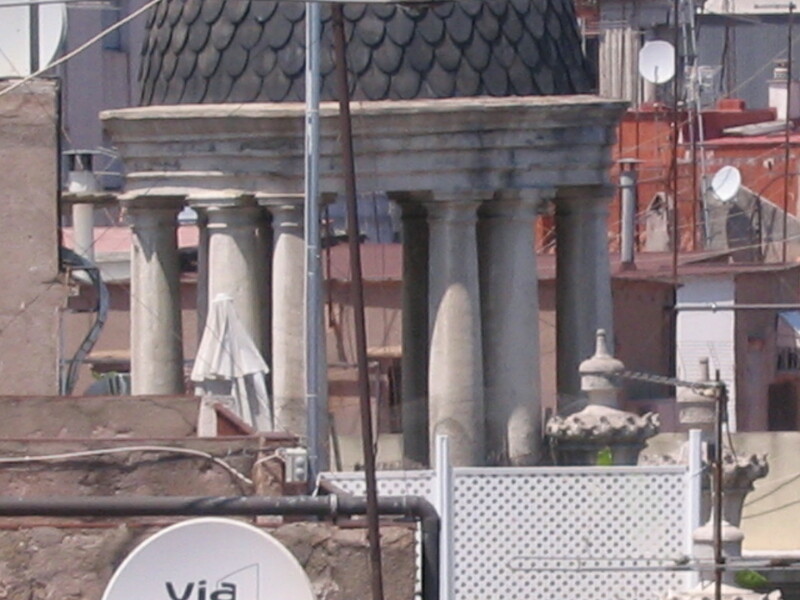 The dome to the north definitely has more columns than strictly necessary. 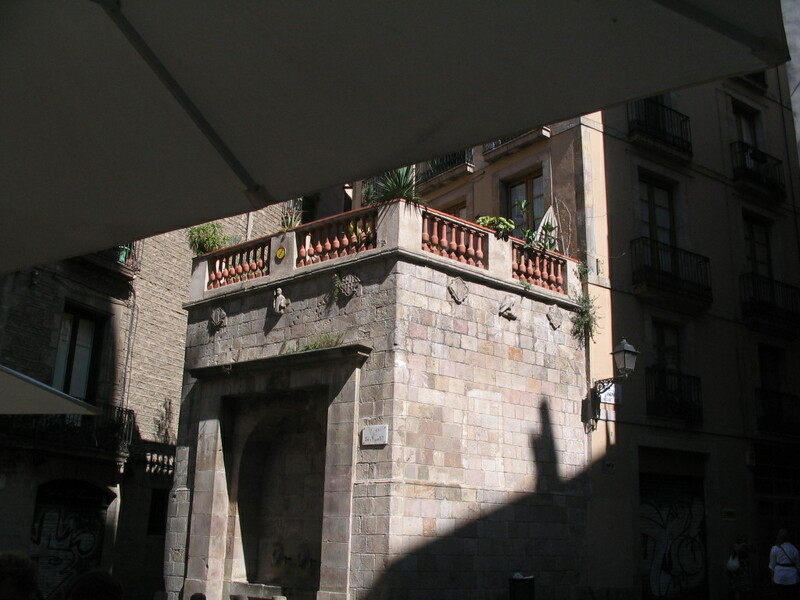 In the late afternoon we walked around and stopped back at the Plaça de Sant Just for a very pleasant café break. 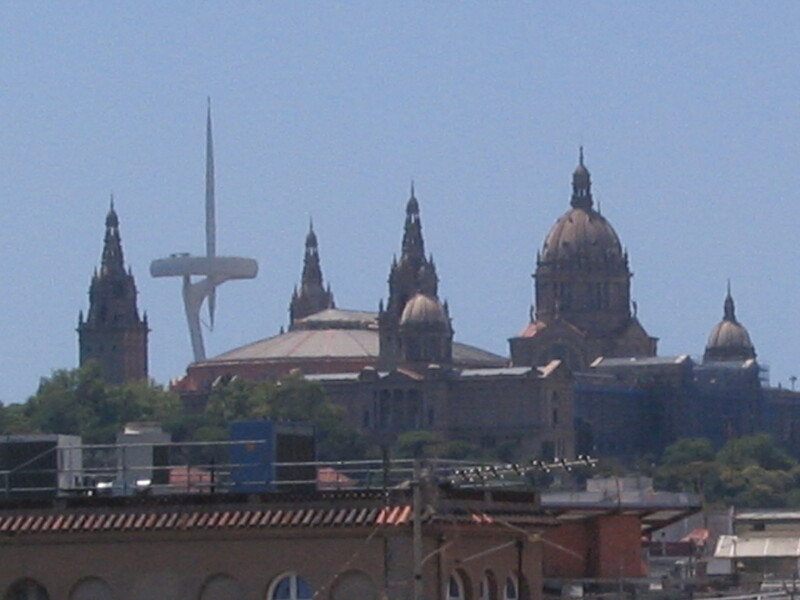 The Plaça is the square in front of the Basílica dels Sants Màrtirs Just i Pastor. 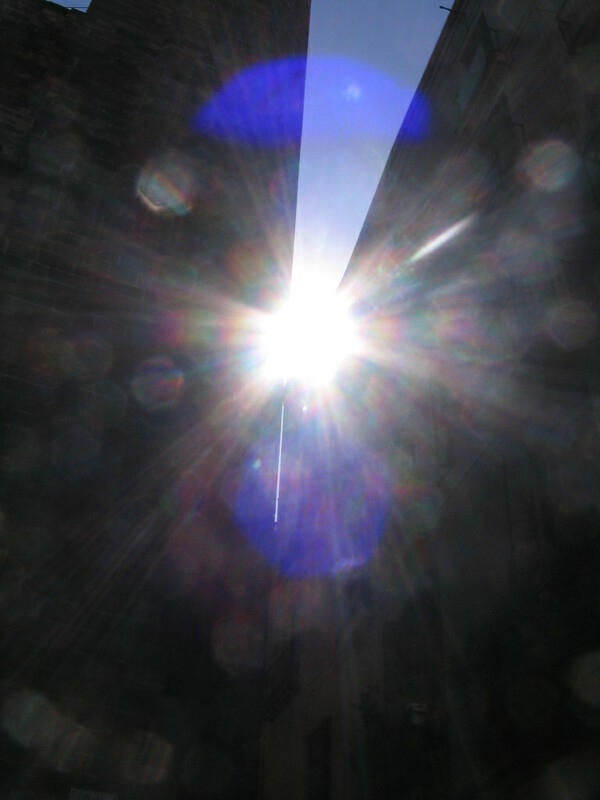 The Basílica's tower is visible to the left of the sun, behind the blue flares. 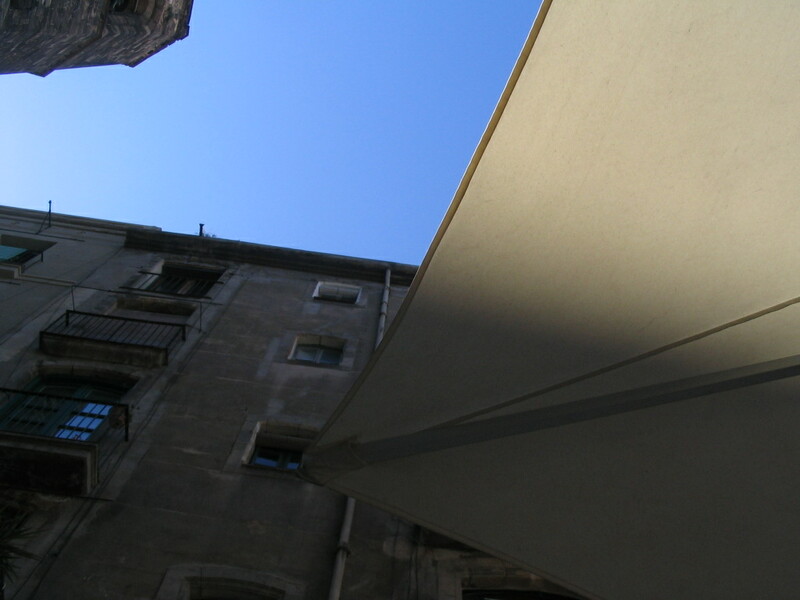 Here the tower is at upper left, while the sun on the parasol nearly aligns with the edge of the sky. 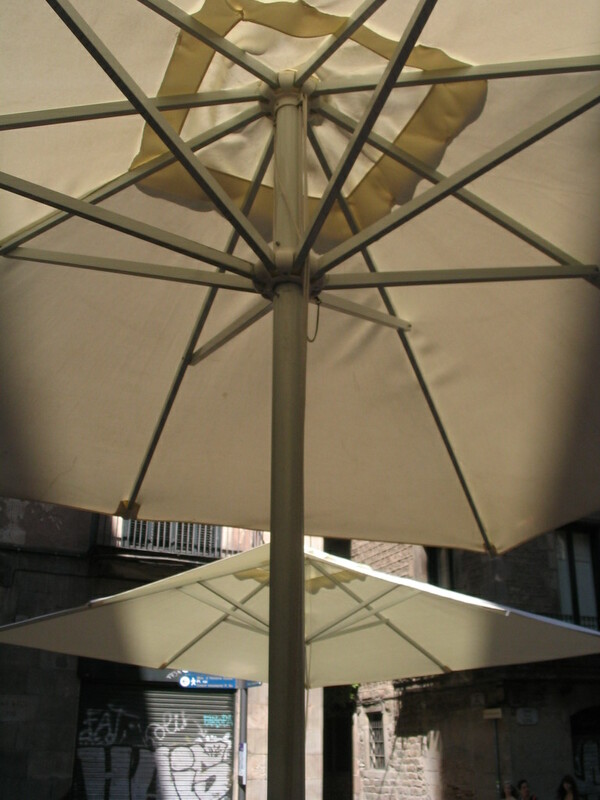 An even more fortituous alignment between the parasol shadows and the shadows on the walls beyond.